Several years ago at a family gathering - I forget the exact occasion but it was likely that it was for Christmas - I was talking to one of my cousins. She was about 12 years old at the time, and fairly bright. I was saying something about icicles. My cousin stopped me and said, "Wait, what's an icicle?" We live in Sydney, where the weather never gets cold enough to form icicles, so my cousin had never seen or experienced one. We don't get snow either, but on rare occasions in the dead of winter it can sometimes get just cold enough overnight to leave a very thin crusting of frost on blades of grass. The one natural form of ice we get is hail, usually in violent summer storms when the upper atmosphere is cold and unstable. Water exists in three common forms on Earth. Firstly as a liquid, which is how we usually think about water. Secondly, as water vapour, either held in the air as humidity or at high temperature as steam. Steam is invisible; the billowing clouds we associate with it are actually droplets of liquid water which condense when hot steam hits colder air. The final form of water is ice, formed when water solidifies into crystals at low temperatures. Ice can form naturally in some climates, but if you don't live in a place where this happens, ice is most commonly found in drinks. Ice cubes are made by putting water into a freezer, a device designed to reduce the temperature inside it to below 0°C (or 32°F). This is the temperature at which water freezes at normal atmospheric pressure. "Freezing" is a term used to describe what a chemist or physicist might technically refer to as a phase transition from liquid to solid form. Snow collects and builds up on top of mountains. As the temperature of a volume of water gets lower, the water loses energy. Heat energy, recall, is essentially the kinetic energy of motion of the molecules within a substance. If the water's surroundings (the inside of a freezer, say) have a lower temperature than the water, then the water will lose some of this energy to the surroundings. Collisions of molecules of water with the air above it or the container it sits in will conduct energy to the surrounding material. There is also a slight heat loss caused by radiation, with the water at a higher temperature emitting more black body radiation per unit of surface area than what it is in contact with, but this loss is very small compared to the conduction loss. Molecules in liquid water are in a loose agglomeration, able to slip freely past one another. This molecular slipperiness means liquid water cannot hold a shape and simply flows to fill whatever container it sits in. It's a liquid as we understand it, in other words. 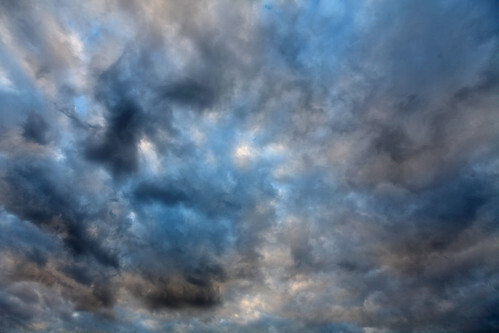 As the temperature gets lower, the water molecules have less and less kinetic energy. Eventually, the energy gets so low that the molecules start to stick to one another, not having enough energy to pull apart the slight imbalance of electrical charge in the molecules. The middle of a water molecule, where the oxygen atom is, has a slight negative charge compared to the ends, where the hydrogen atoms are. When the kinetic energy of the molecules gets too low to allow them to slip past one another, they start to line up into a regular pattern, dictated by the electrical charge distribution. In particular, the molecules form into hexagons in a three dimensional structure. Each hexagon is not flat, but has every alternate molecule raised or lowered from the average plane of the hexagon. This rippling allows the hexagonal shape to be repeated at regular angles to make a symmetrical three dimensional structure. Ice, in other words, is a crystal. The regular crystal structure of ice gives it one of its most unusual and important properties. At liquid temperatures, the heat energy of the molecules means they can slide past one another, easily overcoming the electrical forces between the molecules. This means the molecules can approach each other quite closely and still slip apart, because they are moving so fast. The overall result is that the molecules end up packed fairly close together. When frozen, however, the regular hexagonal crystal structure is dictated by the need for the geometry to work in three dimensions to produce a regular tiling pattern. The molecules form hexagons, but hexagons have a hole in the middle. 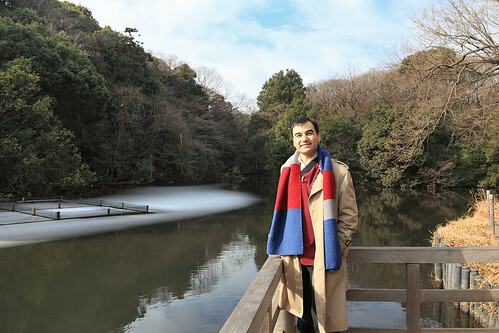 When all is said and done, it turns out that the regular grid-like arrangement of water molecules in ice actually takes up slightly more space than that sloppy, slippery molecules in liquid water. So the same mass of water takes up a greater volume as ice than it does as liquid water. In other words, the density of ice is less than that of water. This is a very unusual physical property. Almost all other materials are more dense when frozen than as a liquid, because freezing typically packs the molecules in closer to one another. Ice bucks the trend quite significantly, as it is roughly 8% less dense than water. Being less dense than water means that ice floats on water. This may sound like a trivial observation, as we are all familiar with the behaviour of ice cubes in a drink. But physically speaking it is a marvel. For almost any other substance, if you had a glass of it as a liquid and you dropped in a solid cube of the same substance, it would sink like a stone. Not only is the fact that ice floats amazing in itself, it is absolutely vital for the existence of life as we know it on Earth. 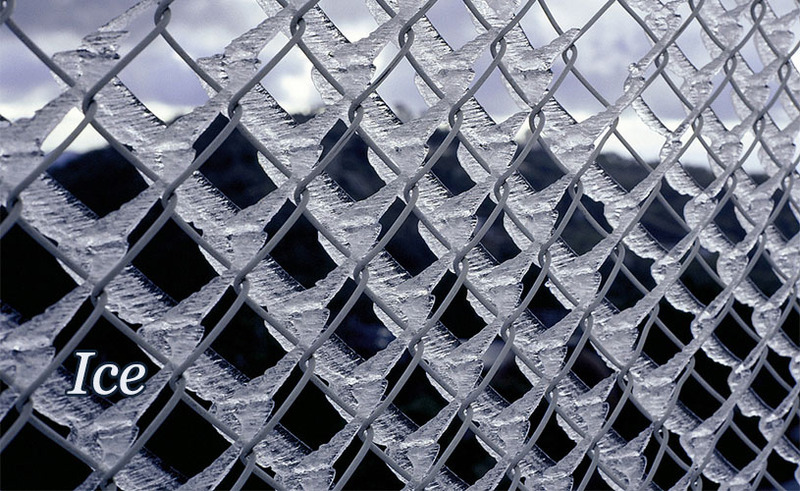 In cold places where ice forms naturally, it forms on the surface of water. A surface layer of ice provides significant insulation for the water beneath, because there is no convection of heat through it. The result is that rivers and lakes almost always stay liquid beneath the ice, providing habitat for the creatures that live there. If ice was more dense than water, it would form on the bottom of bodies of water. This would devastate bottom-dwelling communities of organisms that are vital to the ecosystems of waterways. What's more, it would provide no insulation from further freezing, and the water would freeze, from the bottom up, until it was frozen solid. Aquatic life as we know it would be unable to survive. 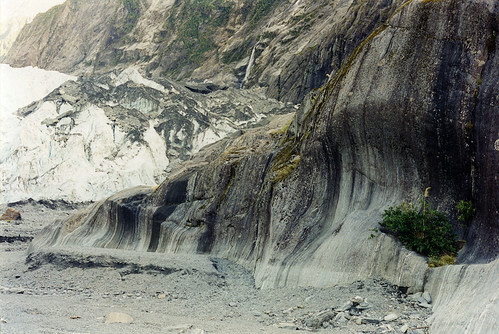 Fox Glacier, New Zealand, oozing down a valley. Ice not only forms on bodies of water. It can also fall from the sky, in the forms of snow or hail. Snow is the most common, globally, and large expanses of Earth's land surface are covered with the frozen remains of snowfalls. 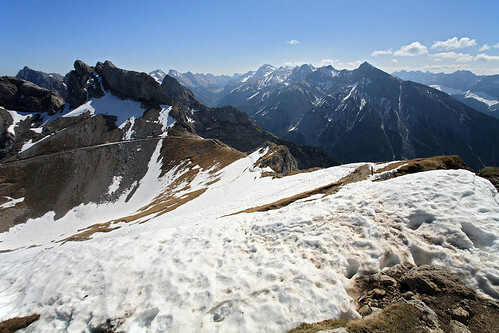 In some places, so much snow builds up each year that it cannot melt fully before more snow falls. When this happens, the weight of more snow on top compresses the snow beneath, forcing out air and eventually turning it into solid ice. The top surface of the resulting ice tends to level out, meaning the ice is deeper in valleys. With a large enough mass of ice, the ice becomes deformable, shaping itself to the contours of the land and flowing slowly but inexorably downhill. Such a flowing mass of ice is called a glacier. The increasing weight of more snow and ice deposited on top pushes it down the valley. Glaciers flow at speeds ranging from almost stopped, millimetres per year, up to meters per day in some cases. Rocks scraped and gouged by a glacier. Like their faster liquid cousins, rivers, glaciers also erode the landscape they flow through. And because they are solid and so massive, glaciers are more destructive than rivers. 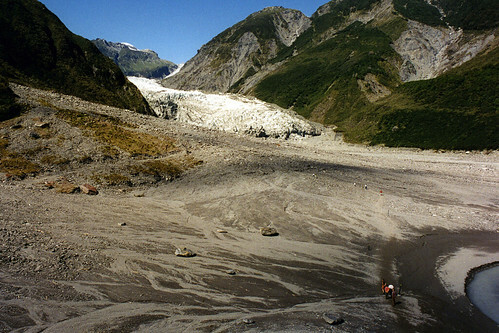 A glacier tends to pick up rocks and boulders embedded in its bottom surface. As it flows downhill, these rocks act like a gigantic scale sandpaper, scouring the face of the valley. Rocks get crunched, cracked, split, scraped, and gouged. The resulting valleys created by glaciers tend to be broad and rounded, which is very different from river valleys, which tend to be narrower and more V shaped. Depending on latitude and climate, glaciers can reach an altitude low enough for them to melt and generate rivers, or they can flow all the way down to the sea. In very cold places like Antarctica and Greenland, ice may simply build up over the entire landscape, forming an ice cap. Parts of this cap, where the slope of the underlying terrain is greatest, will form regions of flow, but these glaciers blend into large regions of static ice. One amazing thing about the Antarctic ice cap is that there are regions of liquid water beneath it. These subglacial lakes have been effectively isolated from the rest of the world for millions of years. It will be interesting to see what forms of microbial life, if any, may populate such lakes. Several research teams have been attempting to obtain uncontaminated samples from these lakes in recent years, but there is no uncontroversial sample yet. Subglacial lakes are not restricted to Earth either. When the Voyager probes surveyed the moons of Jupiter, they found Europa, whose surface was smooth and icy. The moon is covered in a thick layer of ice. At the time, mission scientists assumed it would be solid ice down as far as an internal rocky surface. But later analysis showed that it is likely that there is enough heat within Europa to keep a large layer of water liquid beneath the ice. Similar calculations suggest some other outer solar system moons may also contain sub-ice liquid water. Since we know that liquid water is important for Earthly life, it seems likely that liquid water is a good marker for the possibility of extraterrestrial life. In the past people figured the nearby planets, Venus and Mars, would be the most likely places to find life elsewhere in the solar system. Now we know those planets are fairly hostile places, and there are potentially more hospitable places in the outer solar system. All thanks to the unique properties of ice. Last Modified: Sunday, 22 December 2013; 02:12:54 PST.